I had recently received a review copy of 3D Printing Blueprints by Joe Larson. It is a 300 plus page book from Packt Publishing. This book is basically about creating and preparing 3D models for 3D printing or rapid prototyping. It uses Blender, the popular, free and open source 3D modelling program, as the platform for creating the 3D models for export to 3D printers such as Makerbot. This book is very easy to read and understand. The first part talks about the design consideration for 3D printing. To someone new to 3D printing, this may be valuable information. The middle portion covers the 3D modelling aspects via examples. Basically this portion illustrates various ways of creating water-tight and non-manifold 3D models. If you are already well-versed with Blender 3D, this portion may not be of anything particularly ground-breaking. However, it is quite comprehensive, covering a varied range of model types, from the geometric to the organic as well as static to those with moving parts. how to patch holes in scanned data. There is one chapter on using the slicer application (that typically comes with the 3D printer) to make modification to the 3D data. The ideas presented here is quite interesting. As of this writing, printed materials pertaining to rapid prototyping or 3D printing using open source 3D programs are few. This book may be the only one about Blender and 3D printing. The value of this book thus lies in its ability to present low-cost solution with regards to the fabrication of custom 3D models. Some years back, such low overhead for creating physical models from digital 3D files is nearly unheard of. Overall, I find this book useful and have learnt a couple of new stuffs. I will recommend this book to persons who want to learn how to use the free and powerful Blender for creating physical models. 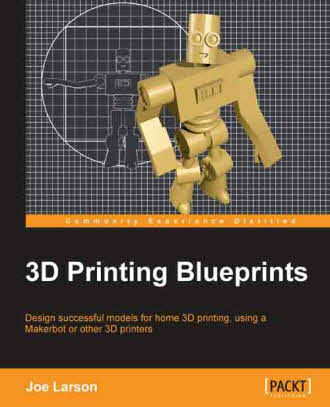 You can obtain more information and/or purchase this book via their website at http://www.packtpub.com/3d-printing-blueprints/book .